View More In Network Antennas - Page 3. 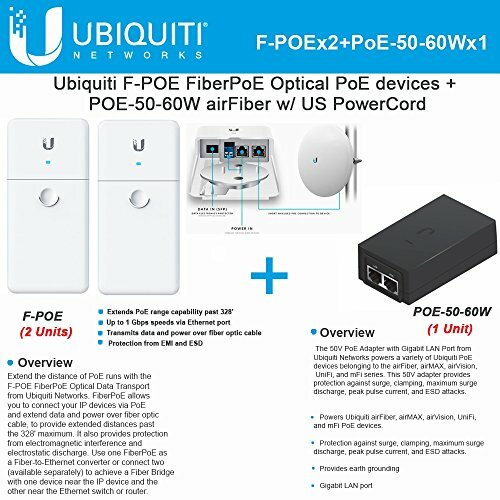 The F?POE from Ubiquiti Networks Optical Data Transport for Outdoor POE Devices FiberPoE DC cabling. The FiberPoE provides fiber connectivity to any PoE device. Reliable Long-Distance Gigabit PoE Runs. Enhanced ESD Protection and EMI Reduction. Power Versatility: The FiberPoE allows separate power from standard Ethernet cables or standard terminal block / power cable support. There are three ways to configure the input and output power. POE-50-60W 50VDC @ 1.2A Power over Ethernet Adapters, PoE Adapters power Ubiquiti products that support passive PoE. Device Protection PoE Adapters are highly reliable, and when used with Ubiquiti TOUGHCable, they provide earth grounding and surge protection to help protect against electrostatic discharge (ESD) events.